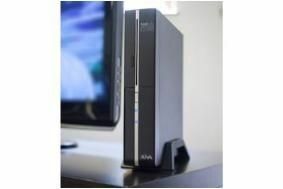 XiVA launches musicm8 NAS with built-in CD-ripping drive | What Hi-Fi? Set to cost around £800, XiVA hopes the musicm8 will prove a suitable partner for devices such as the Sonos system, Logitech Squeezebox and Linn DS. The system can store audio in a variety of file types including WAV, FLAC and MP3 – and allows you to set your bitrate and file size – as well as photos and videos. Accessing your tunes is possible from anywhere in the world thanks to a remote internet facility, you can also stream your tunes to a Nintendo Wii, Xbox or PS3, and the musicm8 is DLNA-compliant. Other features include dual-encoding for storing low and high quality versions of your music, full iTunes support, podcast downloader and online updates. Available from July, the XiVA musicm8 has a suggested retail price of £799.